Now that the newly refurbished Hubble Space Telescope isback up and running, with its first images unveiled last week, the astronomicalcommunity ? and the public at large ? has a bevy of new images and observationsto look forward to. In fact some observations have already producedextraordinary results, not yet announced, from the earliest epoch of theuniverse, according to a Hubbleproject scientist. Hubble wasrevamped during a 13-day shuttle mission in May that gave the 19-year-oldtelescope a new camera and super-sensitive spectrograph and repaired one of itsold cameras and spectrographs, as well as giving it new batteries andgyroscopes, which help it point accurately at celestial objects. These upgrades, performed by the Atlantis astronaut crew,are expected to extend the space telescope's life through at least 2014, if notlonger. Hubble has already started making new observations after itsthree-month checkout phase, with thefirst images showing distant clusters of galaxies, an eerie "pillar ofcreation," a densely packed star cluster, and a "butterfly"nebula. Those observations were the first of many that Hubble willmake over the coming year as part of Hubble's Cycle 17. During about 3,400orbits, Hubble will make observations for 228 programs pre-selected through apeer-reviewed process and submitted by astronomers from all over the world,said David Leckrone, senior project scientist for Hubble at NASA?s Goddard Space Flight Center in Greenbelt, Md. The pi?ce de r?sistance of Hubble'snew mission, perhaps, is the planned new Deep Field image, to be taken withthe newly installed Wide Field Camera 3. Hubble has already made two suchmosaics, which have pushed back astronomers' view ever closer to the Big Bang,which is the theoretical beginning of the universe. The new Deep Field willcontinue that effort in the hopes of seeing some of the earliest galaxies orproto-galaxies in the universe. "The idea is just to push further back in time andfarther out across the universe and get as close to the Big Bang as we can,"Leckrone said. 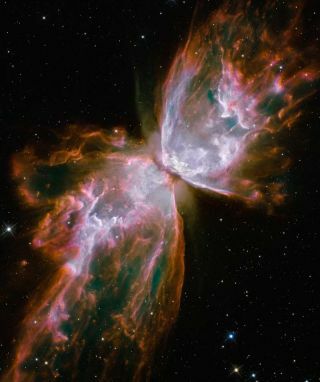 Hubble has already completed the first set of observationsneeded to make this image. The rest will come in a year when the telescope isagain in the same orbital configuration. But the first observations will likelyalready give scientists plenty to work with. "I think they'll have something to say after this firstbatch," Leckrone said. "The rumblings I'm getting are that theyalready have extraordinary results." Leckrone says that the results from the new camera andspectrograph already sound stunning and that the instrument is more sensitivethan mission scientists had expected. "My mouth is watering, I can't wait to hear what theyfind," he told SPACE.com. Hubble's instruments will also be put to use trying tounravel the mysteryof dark energy. A big question in both astronomy and physics is the natureof dark matter and dark energy, Leckrone said: "What's causing theuniverse's expansion to speed up, to accelerate? One of the ways in which Hubble will investigate this mysteryis by refining astronomers' understanding of Type 1A supernovas, the so-calledstandard candles that tell how far apart galaxies are from each other ? a keyto understanding how fast they are speeding away from each other. Another way the space telescope will help tackle thisquestion is by helping to further refine the Hubble constant, the measure ofhow fast the universe is expanding today. "If you can get the error bars on that way, way down tojust a few percent, then that in itself will tell you something about darkenergy," Leckrone said. The brand-new Cosmic Origins Spectrograph will also lend ahand in this effort by probing filaments of dark matter and the ordinary matterthat clings to it and building a 3-D map of matter in the universe, said JamesGreen, the Cosmic Origins Spectrograph principal investigator at the University of Colorado. Because these filaments will likely be probed out to adistance of 7 to 8 billion light-years, it will also help astronomers better understandthe conditions of the early universe. "So we're going to understand an awful lot more abouthow galaxies formed and evolved over time," Leckrone said. This topic isanother theme of Hubble's new research efforts; more specifically,understanding how galaxies are born and grow will help us understand thedevelopment of our own Milky Way, as well as our own star and solar system. "What we're doing is piecing together the whole familyhistory of galaxies," Leckrone said. A plan to map the orbits of Milky Way satellite galaxieswill also shed light on our family history (as well as a more accurate measureof the Milky Way's mass and the amount of dark matter in and around it). Hubble will also continue its work observing extrasolarplanets ? a capability of the telescope only recently discovered. One of the main reasons mission managers wanted to bring theSpace Telescope Imaging Spectrograph (STIS) back online was so that it could goback to work on these exoplanets," Leckrone said. STIS and Hubble's Near Infrared Camera and Multi-ObjectSpectrometer (NICMOS) have both detected exoplanets and NICMOS event detectedorganic molecules on one, "and that was very exciting," Leckronesaid. Right before the servicing mission, Hubble detected a planetaround the hot star Fomalhaut. The team that found the planet hope to observeit again when NICMOS comes back online (as it is expected to in a few months). But those aren't the only instruments that will be probingplanets outside our solar system. "The Cosmic Origins Spectrograph is keen on gettingtheir oar into this water with their very special capabilities," Leckronesaid. Planned research programs will also look at how planetsform, by examining the material around stars to learn more about theenvironment in which planets might arise. Hubble will also be investigating mysteries closer to home,particularly the objectsof the Kuiper belt, including Pluto. Relatively little is known about theouter reaches of our solar system and its denizens. "We don't know what's out there in our own solar systemat the farthest reaches of our own solar system," Leckrone said. But withHubble, "we have the really good tools to go look at these very coldobjects and learn a lot more about how many of them there are and whatproperties they have and what are things like out in the outer suburbs of ourown solar system." Hubble's refurbishment also hits home in a different way:After 33 years of working on Hubble (and 40 years at NASA), Leckrone isretiring on Oct. 2. But Leckrone is happy to go out on a high note. "I feel like the baseball player who is leaving whilehis batting average is still high. I could hang around longer, but this is thehighest of high notes, this is the highest pinnacle that I will have reached inmy career, after 33 years on Hubble," Leckrone said. "So I think thisis a great time to go out, and it's a great time to go try do some otherthings, including maybe getting into some research with Hubble." Asked what of Hubble's new projects he was most excitedabout, Leckrone said, "The deep field is what I'm really keen on." And Leckrone is happy with the final version of Hubble thatNASA has given the world. "I think we've done our job, providing the very bestmodern, cutting-edge tools, and a whole bunch of different tools, of differentkinds, that will give the scientific community around the world the best possibleopportunity to succeed," he said. "Now it's up to [astronomers] to godo it. Let's go, let's get it done."